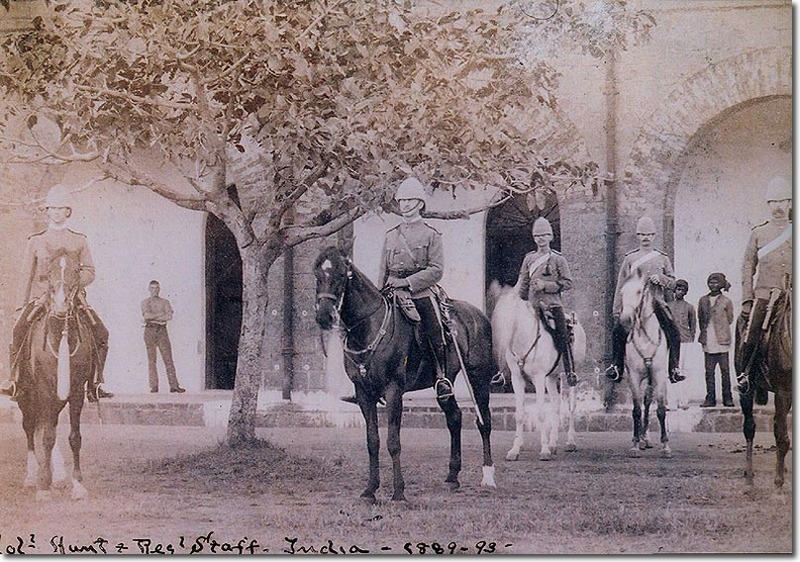 This photo taken in Secunderabad is of the commanding officer Lieutenant-Colonel J L Hunt, in the middle, with another officer on the left. They both wear khaki frocks with a Sam Browne belt. The regimental distinction of showing white shirt collar above the frock collar can be seen here. They have dress breeches with gold stripes down the seam, and black boots. On the extreme right of the photo is the Regimental Sergeant-Major who has an embroidered crown badge on his sleeve, and a white pouch-belt. He also has gold stripes on his breeches. Of the two men mounted on pale horses at the rear, the one on the lighter colour grey horse is a trumpeter with Royal coloured cords and tassels to his trumpet. These men have yellow stripes on their breeches. The shoulders of all ranks are adorned with shoulder chains which are not the same shape as the later versions. The helmets are covered in khaki cloth and have no spikes on the top. Another picture of Colonel Hunt shows him with the white dress helmet with gilt spike on top.